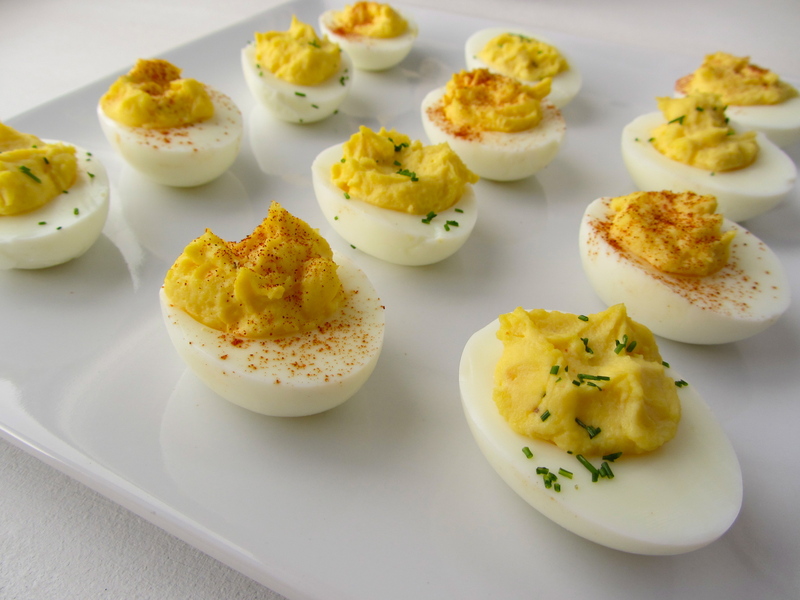 As a lover of eggs, having them in deviled form is an exceptionally wonderful treat. They not only look so darling and decadent, but also smell delicious and taste delightful from the subtle hint of added truffle oil. As the saying goes: we eat first with our eyes, then nose, and lastly, our mouths. 1. Place the eggs in a medium saucepan and fill with cold water just enough to cover the eggs. Cover the pan and bring to a boil. Once the water reaches a boil, turn off the heat and allow the eggs to remain in the hot water for 13-15 minutes, then rinse them under cold water to cool before peeling the shells. 2. Slice the eggs in half lengthwise. Gently remove the yolks. 3. In a small bowl, mash the yolks with a fork until finely crumbled. Stir in the mayonnaise, salt, and cayenne pepper until thoroughly combined. Then whisk in the truffle oil, a couple drops at a time, to taste. Whisk until egg yolk mixture is smooth and fluffy. 4. Spoon yolk mixture into the egg whites, then dust with paprika or garnish with the chopped chives. Serve immediately or refrigerate until ready to serve. * For a more refined presentation, use a pastry bag to pipe the yolk mixture into the egg whites. * Slice a sliver off the base of each egg white to help keep them from sliding around on the plate. * I use a white truffle oil because it has a lighter taste than its earthier, black counterpart.